Ok…anyone who knows me knows how much I am obsessed with adore Target and Ikea. They both continue to produce great pieces at even better prices. This isn’t new to any of you, obviously. 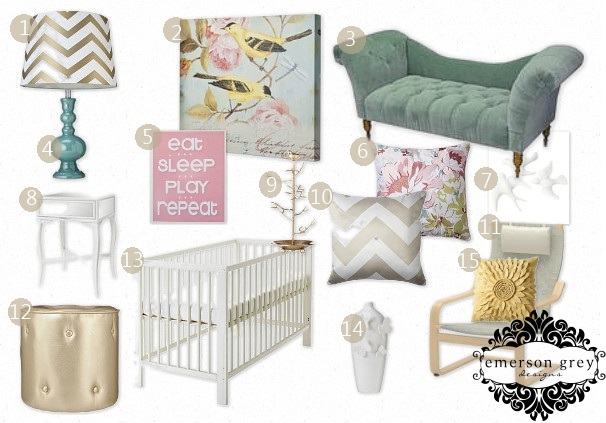 I just thought I’d create a nursery design board using the majority of the pieces from these two superstores. I did a post recently talking about the new Golden Days collection at Target. I have to say I walk down the aisle to stare at these pieces each time I visit Target, which with two kids is at least twice a week. These items are so girly, chic and amazingly priced. I don’t mind mixing romance, curves and sleak lines together. It can really add some quiet appeal to a room. There are no rules. Why not design a nursery around them? The entire cost of this design board only came to $897 plus tax. And that is with the $399.99 splurge on the settee. There would definitely be other expenses involved…crib sheet and skirt if wanted, paint on the wall, drapes, but they too can be purchased at such a low price. It is so fun and so possible to create a nursery on a budget. It’s a challenge I love to tackle. Where did you purchase Item #3 the small couch? I don't see that on Target as part of the Golden Days Collection. This room looks amazing! Hi Amanda..the chaise sette is also from Target, but that exact one seems to have sold. Here is a link to a similar one that is just a bit more expensive then the one pictured.